Canada is considering expelling Russia's ambassador in Ottawa, reviewing the decision on an hour-to-hour basis following a stern conversation yesterday between senior officials at Foreign Affairs and Ambassador Georgiy Mamedov, Foreign Affairs Minister John Baird said Sunday. Baird said he had never, in his time as foreign affairs minister, conducted such a harsh dressing down of a foreign dignitary. "Yesterday, when I was returning from Kyiv, my deputy minister and associate deputy minister called in and demarched, certainly in the strongest terms during my time in Foreign Affairs, the ambassador," Baird said in an interview on The West Block with Tom Clark. 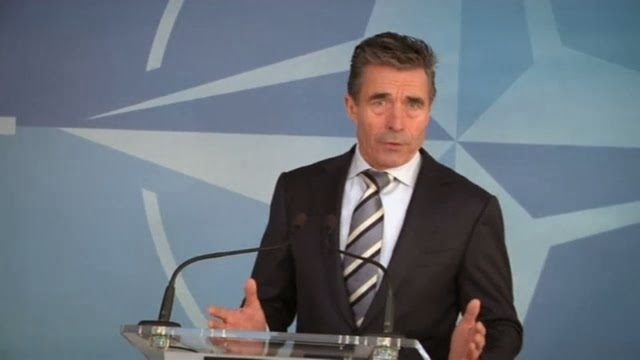 "We strongly condemned the provocative actions of his country and President Putin." 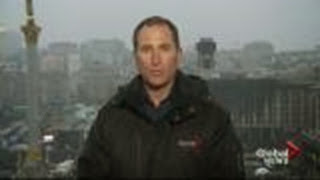 WATCH: Global National's Asia correspondent Paul Johnson from Kyiv says there's a sense of impending war in Ukraine. While he and his office consider expelling the ambassador, Canada is concentrating on working "in unison with the democratic world to say this type of Soviet-era invasion of a neighbouring country is completely unacceptable," Baird said. Also on Sunday, Ukraine's new prime minister urged Russian President Vladimir Putin to pull back his military in the conflict between the two countries, warning, "we are on the brink of disaster." 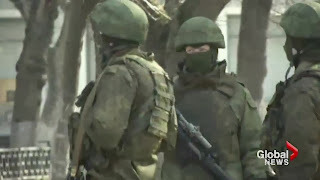 The comments from Arseniy Yatsenyuk came as a convoy of Russian troops rolled toward Simferopol, the capital of Ukraine's Crimea region, a day after Russian forces took over the strategic Black Sea peninsula without firing a shot. WATCH: Russia's intervention in Ukraine has escalated tensions in the region. Paul Johnson reports. So far, the new government in Kyiv has been powerless to react to Russian military tactics. Putin has defied calls from the West to pull back his troops, insisting that Russia has a right to protect its interests and Russian-speakers in Crimea and elsewhere in Ukraine. However, there has been no sign of ethnic Russians facing attacks in Crimea, where they make up about 60 per cent of the population, or elsewhere in Ukraine. In response to the escalating crisis, Prime Minister Stephen Harper called an emergency cabinet meeting Saturday, after which he announced Canada was recalling its ambassador from Moscow and pulling out of preparations for the upcoming G8 Summit to be held in Sochi, Russia. 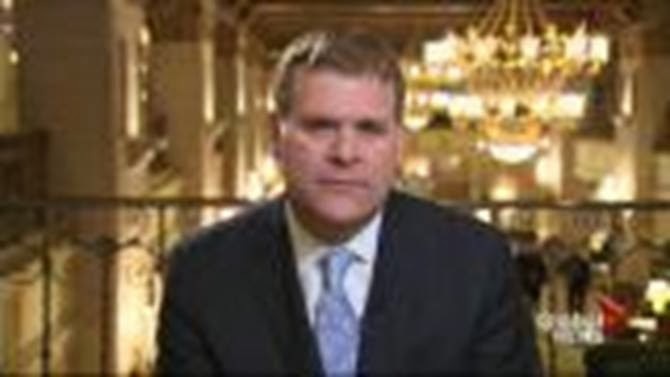 "If (Putin) continues with this provocative action, there's certainly no way I or Canada would want to have anything to do with Russian world leadership," Baird said of the upcoming meeting. The minister was adamant Sunday that Russian President Vladimir Putin's actions are completely unjustified and even "ridiculous." "He has no right to invade another country, a neighbouring country that's struggling for freedom and democracy," he said. "The excuses and rhetoric coming out of Moscow are unacceptable. No one is buying them in the Western world and they make President Putin look ridiculous." Russia is also preparing to launch the Paralympics next week in Sochi, where Baird said he is reconsidering any government involvement, though Canada will not boycott the games. "We don't want the athletes to pay the price for this," he said. "But politically … I don't think there's any way we'd want to have senior-level government leadership going there to somehow glorify Russia's leadership."